There are different theories on the proper time to prune a plant. When we bought this house twenty years ago there were dozens of rose bushes, front and back. I “hard” pruned them once a year in January, removing crossing branches and dead limbs and leaving little more that a few inches of stem. My neighbor looked on aghast, but I assured him all was well. Sure enough, the flowers bloomed year after year. I’m not a big fan of roses, so we gradually replaced them with other plants. 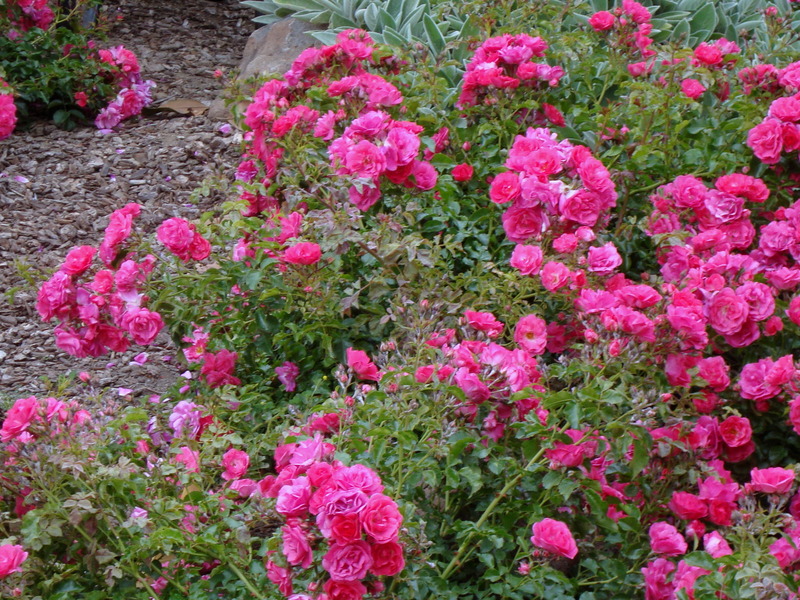 One of our neighbors took all of the pink roses and transplanted them in the garden of her rental property. It was nice to see them go to a good home. 2010: Rose bushes on their way out. Last fall I decided to split the difference. I left a few of the plants untouched, while pruning the others just above the buds. 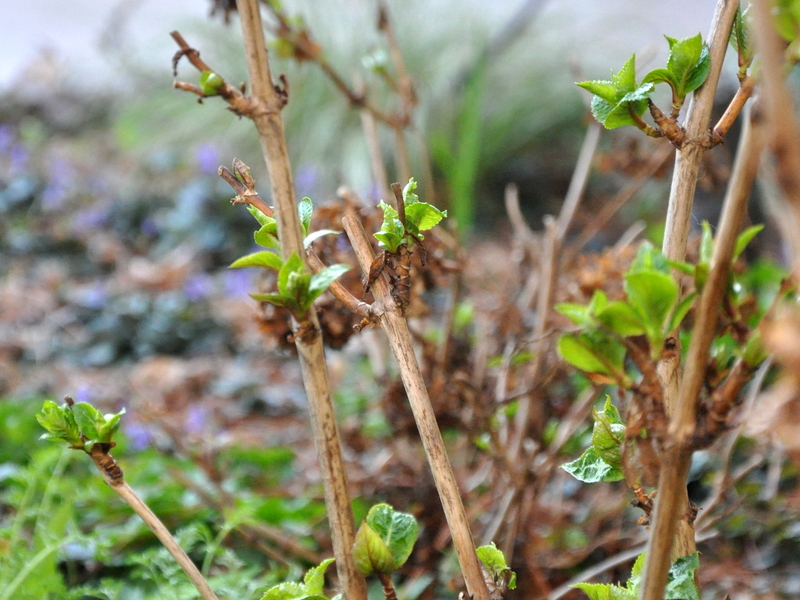 All of the hydrangeas are showing new growth, but the ones I left untouched look healthier. The growth appeared just below last year’s spent bloom. It was a wonderful experience cutting off the dead blooms and exposing the lovely lime green of new growth below. Don’t you just love that color? 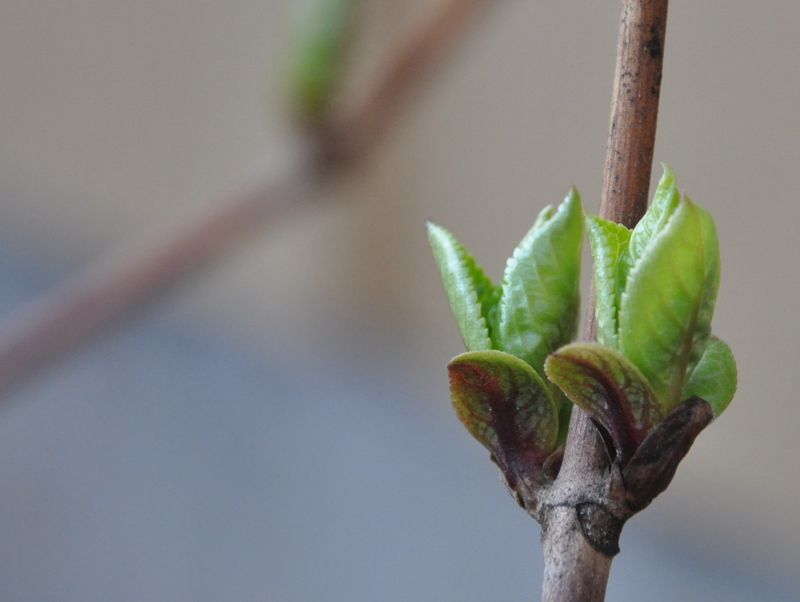 Hydrangea: New growth on old wood? 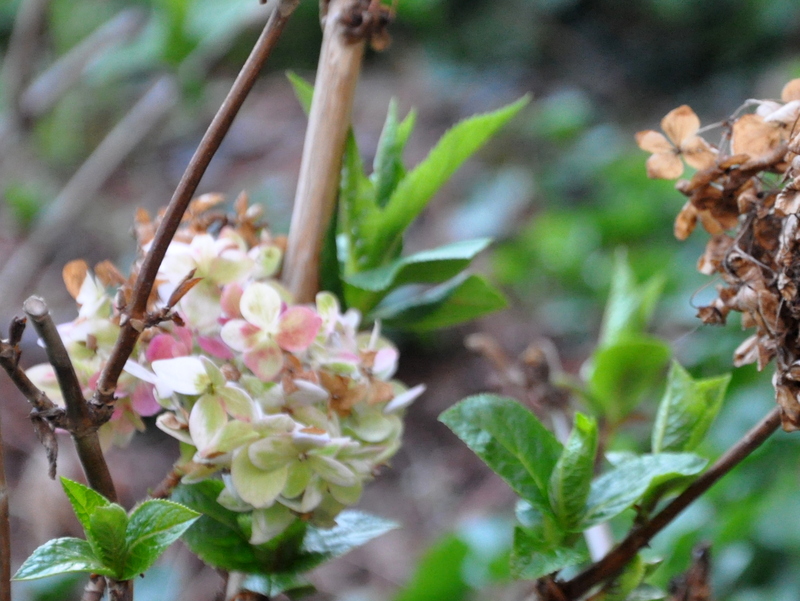 Hydrangea: A small bloom…in February. The same site shared this video, saying it depends on when your hydrangea blooms, spring or fall. Since ours bloom in the spring but continue to bloom through the fall, it seems that I should have pruned last fall after all. I’m back to being confused. I’ll report back in a few months when the plants are in bloom. Life in the garden is never dull. 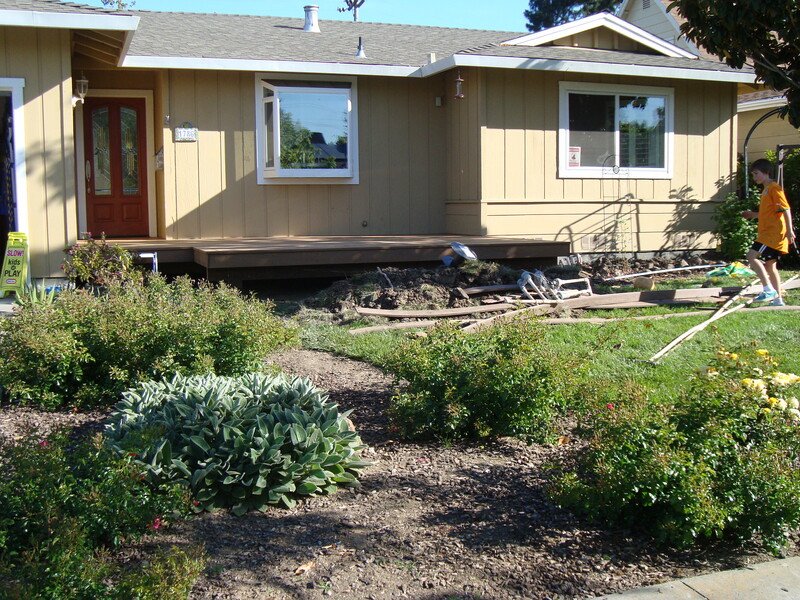 This entry was posted in Gardening and tagged gardening in san jose, hydrangeas, Pruning, pruning hydrangeas, roses. Bookmark the permalink. 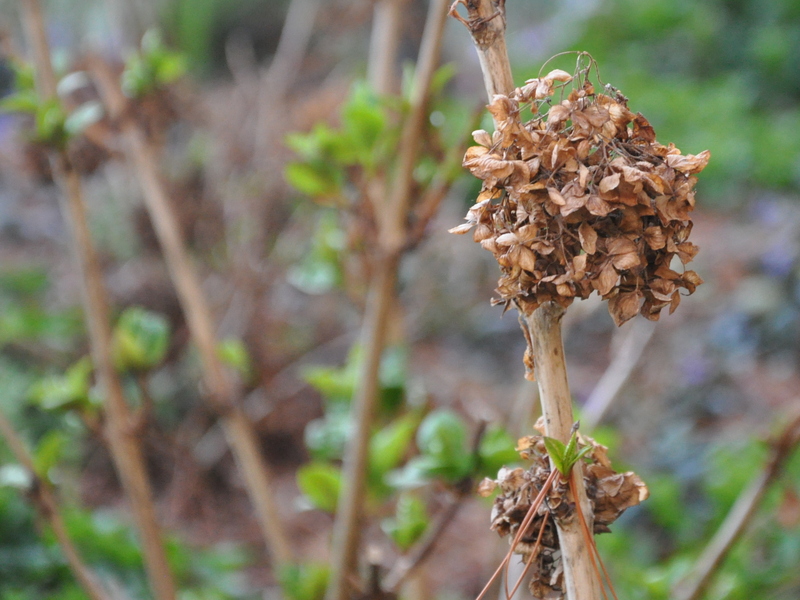 Hydrangeas’ old and new wood confounds me…so I do as you did and split the difference, but on the same plant. It has generated the best results so far…although it does look a little silly in winter! On the same plant! What a great idea. In the end, I’m thinking that if the plant grows and thrives, I’m doing okay. I’m learning to live with silly and bare in the winter, too with better results. Never a dull moment in the garden, eh? I love the sound of a Mayday Tree. I’m going to look that up. It’s nice that you have such a pretty boulevard in the spring. Your house is adorable, front, back and center. You create the most beautiful vignettes. We can count on aphids here, too. They seem mild now that I’ve had to deal with squash bugs for two seasons. They are so gross!!! Back to say thank you for your message hon. I zoomed by a couple of days ago but didn’t have time to comment. I think our front street is pretty too, especially in spring. I have work to do out there but haven’t totally decided what I need. I don’t want to go too overboard. I’m a lazy gardener now a days and prefer shrubs that look pretty but don’t need much attention. The perennial boarder at the lake looked so cottagey but my gosh, very time consuming. I’ll bet that lakeside border was gorgeous under your capable hands. But yes, lots of work too. I look forward to seeing what you decide. Oh how depressing that is. Do you know, the same thing happened when we sold our family home in Ontario. My dad built that garden from a dirt lot. The new owners weren’t into gardening either. It was sad for him to go back. I’m sorry they didn’t at least offer the plants. And I’m sure glad I’m not living next to a lake property with a 5th wheel trailer. Ugh. We do have lots of fun places to buy pumpkins. We started growing them because of M’s love of pumpkins and gardening. The squash bugs are a big problem for farmers. Some of the cantaloupe farmers grow pumpkins as the sacrificial plant so they’ll leave the cantaloupe alone. They fetch a lot more dollars per pounds. They are tough bugs! I have exactly the same problem Alys… mostly with Hydrangeas and shrubs like Potentilla. I think I will have to make a note of when and how much I prune some shrubs, and work out what works best. The experts may be right for their own plot and climate but not for mine! Lovely to see that fresh green on your Hydrangea. 🙂 Things are slowly moving along here too. Cathy, I’ve been thinking lately that one of the pluses of keeping a gardening blog over the years is that I have an ordered reference with posts and pictures that I can now refer back to. It’s been fun. I do a better job tagging now, too, so I can go back and find things. I’m glad to hear that your garden is easing toward spring. It’s less than a month away! PS Perhaps a garden journal with photos and dates. That would be fun. An excellent idea… I really should try and use tagging better too. Thanks Alys! I think I will stay confused for eternity with the when to prune question. I’m seeing new growth on my hydrangea’s in front that I didn’t prune last fall but not on the one on the hill that I did. Maybe I’ll get a closer look this week. I love roses but they need to be somewhere other than where you need to get to to paint. 😦 Pruned mine way down in the fall. We shall see. I’m ready to move them all to the top of the hill if I can. Maybe next fall. Your hydrangea’s are looking well. And now you know that your lovely darlings like a haircut in the spring. I love looking at roses, smelling roses and waving at them in someone else’s garden. 🙂 I’ve been scratched within an inch of my life for years of pruning. The roses here attract aphids, rust and other fungus so I was really happy to let them go. You’re right about the paint, too. I know what you mean, one book says one thing and then the next one you pick up contradicts what you have just read. The Bulgarians on our street swear by a certain date of the year for things like planting and lifting their grapes. Easter is Bulgaria is later this year so I’m not sure how that is going to pan out! I leave our rose pruning to my husband and then if they don’t do well the following year I can blame him. Very naughty of me! Good luck with the hydrangeas, I planted a couple of my own last year – it will be interesting to see how they fair. LOL Nice to pass on the pruning to your hub. That made me smile. I hope your hydrangeas do well, Aileen. They’re glorious plants. I know that the Farmer’s Almanac will often tell you when to do what gardening chore, and they’re published (at least I think they are) by planting zone. Our local paper used to publish an annual garden calendar of chores that I saved and referred to for the year. Sadly, the columnist died and no one took up the mantel. Please let me know how your hydrangeas do. They sound like a great idea, its a shame your paper no longer publishes it for your region, simple but useful snippets like that seem to be disappearing from newspapers. Hubby relies on the TV show Gardeners World for a lot of his information but the weather in the UK in the summer is vastly different to Bulgaria so when Monty is just planting out his sweetcorn for example, we have already harvested and frozen ours. Still it’s the unpredictability that makes gardening such fun! Sadly, newspapers are a dying breed. I can’t imagine it, myself. I love the internet, but I love having a newspaper, magazine or book in my hands, too. They’re different experiences. How long have you lived in Bulgaria? Do you ever visit the UK? I feel the same way about novels, downloads are great and very convenient but its much nicer to be turning the pages of a book. I’ve been in Bulgaria for 5 years now. I work in the UK about 3 times each year for a couple of months at a time. It’s hard being away from hubby and the dogs but needs must. It’s not all bad, there are some benefits – I get to see more of my mum and my sister and I am going to the One Live Festival in June (can’t wait!) and planning a sponsored charity walk in August in Scotland. It’s given me back a bit of independence and with it more confidence. I will be back in Bulgaria in 4 weeks time, I’m looking forward to preparing the garden for spring planting! I didn’t realize you went back and forth so often. That must take a bit of a toll. I bet the dogs miss you and wonder where you disappear to. Don’t you wish they could talk sometimes? I’m glad you are enjoying the independence with the added bonus of time with your mum and sister. All very nice. I visited Scotland in 1989. What a beautiful country. England too. Yes it does a bit but I’m getting into a bit of a routine now and I keep telling myself it won’t be forever. I talk to Billy on the phone, I don’t know what his reply is, he just pants a lot! Yes it’s super to spend time with my family, neither are in great health so to be able to have so much quality time with them is a real bonus. Scotland is beautiful, my sister lives in Arbroath. My niece and I are going to do a sponsored walk in Scotland, I can’t wait to take in the spectacular scenery. Your sponsored walk sounds wonderful. I can picture it now. How sweet that Billy talks with you on the phone. I wonder what he would think if you Skyped? He might go nuts from seeing you but not being able to touch you. Lots of wonderful homecomings for you in both places. That part of it is nice. I dread to think, he gets over excited on just the phone! Yes, the sponsored walk will be great fun, just need to get fit, the gardening will help. Thanks for the good wishes, yes seeing everyone again is definitely the best part. You’re right, seeing you would probably be too much. But you’ll be home soon, and I know he’ll be overjoyed. You’re definitely not alone in wondering when to prune, Alys. 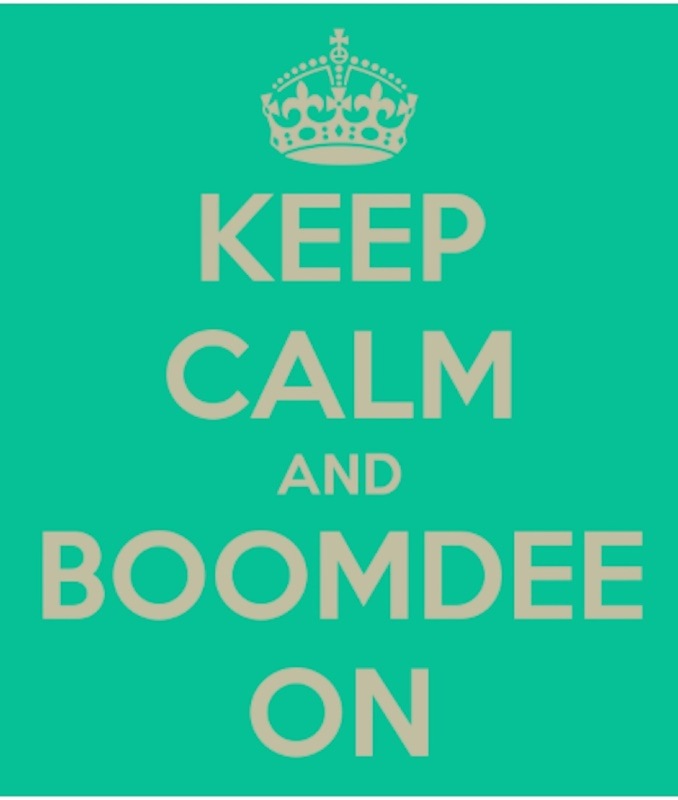 Especially with this winter being so warm, I just don’t know…. And there is the question of how exactly to prune. So, I’ve done the apple tree (minimal needed) but left the blueberries and roses.